The traditional approach to video surveillance is to blanket a property with low-res VGA cameras to catch suspicious activities from any angle. But with Avigilon's 29 megapixel JPEG2000 HD Pro, you can slap a wide angle Canon lens on the end and cover an entire parking lot in one fell swoop. 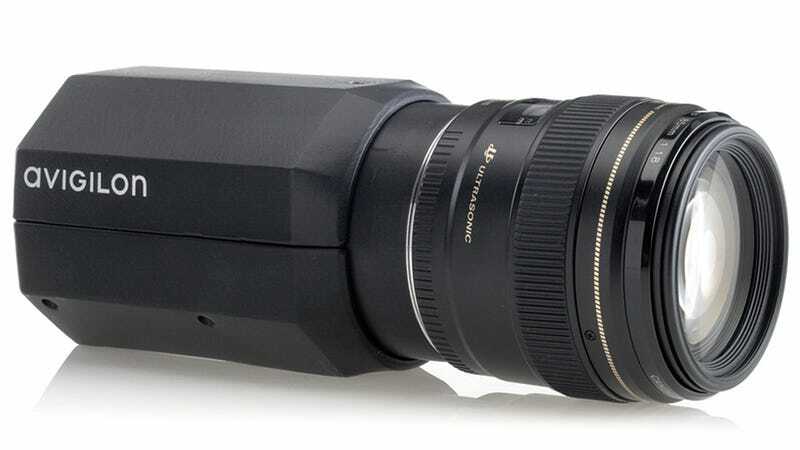 It might border on overkill, but there are good reasons for using a high-resolution security camera that can accept EF mount lenses. Besides ensuring images aren't going to be obfuscated by a cheap lens, there's sufficient detail to make out faces and even license plate numbers from a fair distance. And a fast expensive lens can considerably boost a camera's low-light performance. Although, you'd want to keep the f-stop in check to avoid a useless shallow depth of field. Avigilon claims the camera provides the same amount of coverage as over 95 VGA resolution cameras, but that's assuming they'd all be pointed in the same general area. It's also limited to a frame rate of just two shots per second, but that's a fair trade-off if it yields a clear shot of a perp that leads to an arrest.